The architects from Ecuador-based studio Natura Futura Arcquitectura created a “House of Prayer” in Babahoyo, in the Los Ríos Province. It is a space devoted to faith that will be constantly evolving so as to meet the needs of those involved in its permanent construction. With its 140,000 inhabitants, Babahoyo, in the Los Ríos Province (Ecuador), is a rapidly growing city. Along with the increase in its population, the need for places devoted to faith, reflection and encounter is also increasing. This is why the architects of studio Natura Futura Arquitectura, along with the inhabitants of a neighbourhood where security is quite an issue, decided to create an architecture that could meet several needs, while also being sustainable from an economic and environmental standpoint, and without overlooking aesthetics. As they always do, the young architects of Natura Futura Arquitectura immediately involved the worshippers in the design and construction phases, to create an inclusive and shared architecture. One of the objectives of this new space, indeed, is to work with children and carry out workshops and sustainable practices granting the citizens better control over the territory through appropriation of space. This is an extremely important element, as the increased presence of the local community allows to ensure the security of those who live in this neighbourhood. This way, an architecture is created, that is open to dialogue with the city. The project started from an old house that the architects decided to completely demolish. They only preserved its wooden beams, to include them in the new building. The new volume used the very same materials used by the previous building and the rest of the neighbourhood, such as exposed bricks and painted galvanised sheet. The wood frame of the façade lets the light in, creating a play of light and shadow and a feeling of permeability and lightness, further enhanced by the natural light from the ceiling, illuminating the altar. The House of Prayer fits perfectly into the neighbourhood, becoming the new heart of its social life. This space has a great visual impact. 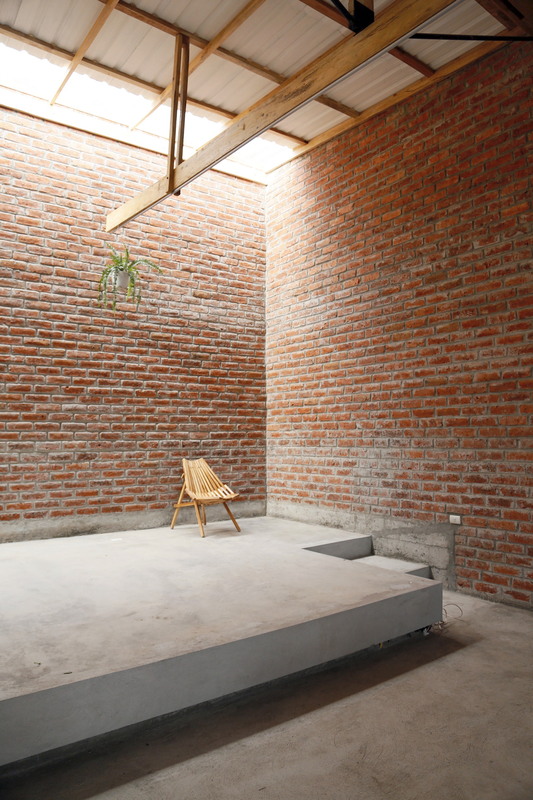 What’s more, thanks to the careful use of light and materials, the architects of Natura Futura Arquitectura studio did not realise a simple physical space, but an emotional space, where everyone can disconnect from their everyday life and reconnect with their spirituality. In short, it is a virtuous example of participated, sustainable architecture.